The winning Powerball numbers have just been announced: 1 21 43 44 49 29. Someone in Oregon—where the winning ticket was supposedly sold—is now worth $340 million, the biggest jackpot in lottery history. Congratualtions to him or her, right? Well, maybe not. As anyone who watches ABC’s LOST can tell you, winning the lottery jackpot could be the worst bit of BAD luck to befall you. In fact, if I’ve learned anything from watching the show it’s not to play the lotto. That which won’t stop is apparently a string of ill-fated events, including the infamous crash that put our folks on the island in the first place. Hurley, spooked out by this whole Pandora’s box hysteria, follows a lead from the psychiatric pateint to a chap in Australia who discovered the numbers sixteen years ago. But upon arriving in Australia, Hurley discovers that not only did this chap use the same numbers to win something (in his case he correctly guessed the number of beans in a big jar) but he also had a spell of bad luck so intense that he committed suicide four years ago. And that’s our first numeral clue: the last poor chap to use the numbers died . . . FOUR years ago. Four is of course the first number in the mysterious sequence. 815 = The next three digits are the flight number of the Oceanic (fictional airline) flight from Sydney to Los Angeles that crashes on the island. 16 = The number of years the French chick has been on the island, and the number of years ago someone first heard the number sequence being broadcast via radio. (Incidentally, one of the two people who heard that sequence is the very poor chap who commits suicide twelve years later). 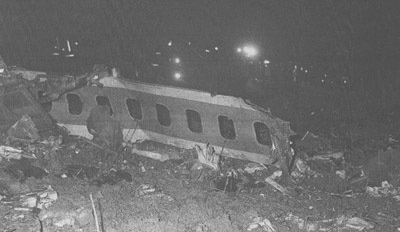 23 = When the plane crashed, it split in two. Twenty-three is the number of survivors from the back of the plane who, throughout the entire first season, were believed dead. 42 = Yet unconfirmed, but believed (by me, anyway) to be the number of survivors from the front of the plane. They keep saying that there are “about forty survivors.” My guess is that if anyone counted, the number would be forty-two. So we see that each of the numbers has incredible significance. How all of this is possible is yet to be seen, but it’s clear that all the numbers mean something. Which brings me to this week’s Powerball numbers. On LOST, the second, third, and fourth digit of the sequence is the number of the flight that crashed: 815. The second, third, and fourth digit of this week’s winning Powerball is 214.